Private Oceanfront Corner Direct Oceanfront Corner!! 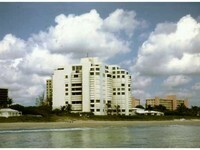 Large Terraces Off The Living Room And Master Bedroom, Oceanfront Tennis Court, Excellent Security, And Exercise Room. New Impact Glass On Entire Building, New Railings, And Refinished Balconies.